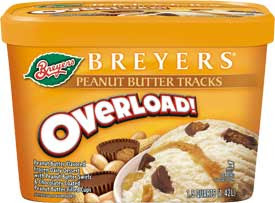 I was at Market Basket Thursday night and I spotted two Breyers overload flavors that were new to me. The first was Very Chocolate Cherry and it was Very hard to miss with it's red packaging. It's cherry frozen dairy dessert with cherry pieces and chocolate flavored chips. Yeah, there's nothing like REAL chocolate-FLAVORED chips (that would be sarcasm and pretty much a dig at anything that says FLAVORED, uggg, I'm just being cranky about sematics). ok, it's not much of a story, and it's not like these two flavors are new (though it is weird to see them for the first time). I'll get something new on the blog tomorrow since we decided to cheat and tried to finish off a couple of older containers today. peanut butter swirls vs fudge swirls I guess. I'd be down for a head to head. Also, there are some new flavors from B&J that I'm dying to see reviewed. I'd really like to see Milk n Cookies reviewed. I've also seen peanut brittle in the mini containers. wait, peanut brittle in a mini? Oh I'm definitely keep my eyes open for! "What distinguishes our Frozen Dairy Dessert from our Ice Cream is that it’s blended in a whole new way to create a smoother texture, tends to have lower fat, and maintains a better texture throughout distribution...from our freezer to your home freezer." 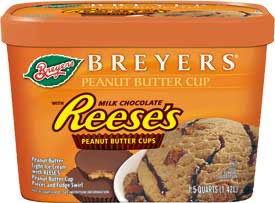 "Breyers® offers a wide range of products to meet the different taste, nutritional, and value needs of consumers. 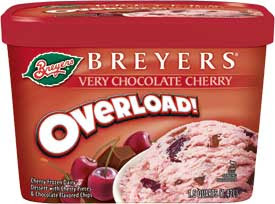 Many flavors will not be converting to Frozen Dairy Dessert, including: Natural Vanilla, Natural Strawberry, Chocolate, French Vanilla, Vanilla/Chocolate/Strawberry, Mint Chocolate Chip, Homemade Vanilla, Coffee, Vanilla/Chocolate, Lactose-Free Vanilla, Triple Chocolate, and NASCAR® Checkered Flag." They took an outstanding product and reduced it to the mundane. How sad. Anybody else have any comments? When i want to ruin my diet i love real ice cream. Bad breyers ruins great tasting ice cream making ice cream into dairy garbage. its ok i will take my $6.00 for not nearly a half gallon and buy hagen daz; at least hagen daz is real and thats what i love-real ice cream.